Photo taken in April 2010 in Rabat, Morocco. I stayed at a Riad or ancient Moroccan palace turned into a hotel, in the heart of Rabat’s souq. 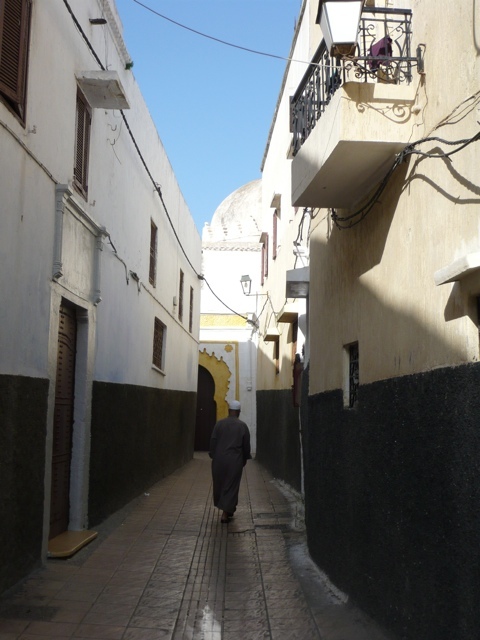 Finding the Riad was half the fun as I wandered somewhat aimlessly through narrow, serpentine alleyways like the one pictured above. I felt like I had been transported back in time, to a world long ago. I was fascinated by the life and culture of Morocco and hope to return someday soon as there is much left to be discovered. Hi thanks for having the post. I am planning to go to Morocco. I will see the this Morocco Hotels . Do you know which time will best to vist there?